A forty-year-old cheerleader? When Laura Vikmanis, a single mom in Ohio, told friends that she wanted to be an NFL cheerleader, they said it would never happen. But she proved them all wrong. . . .
Laura Vikmanis has got spirit . . . and pom-poms, too! But before she stepped onto the field as the oldest cheerleader in the National Football League, she was sidelined by a bad marriage and the many responsibilities of stay-at-home motherhood. She finally got the courage to leave her husband and to ask herself something she had never asked before: What do I want to do? Remembering her teenage love of dance, she signed up for a pole-dancing fitness class, where she met a former cheerleader for the Cincinnati Bengals. When the woman suggested that Laura audition to be a “Ben-Gal,” Laura laughed her off but soon realized that the audition process could be a way of healing herself—and regaining her confidence. Her boots were made for walking—but also for stomping on a football field. She tried out for the team next to girls young enough to be her daughters. Girls with tighter abs, fuller hair, no kids, and no crow’s-feet. After much adversity and multiple auditions, she finally made the team, becoming the oldest cheerleader in the League. 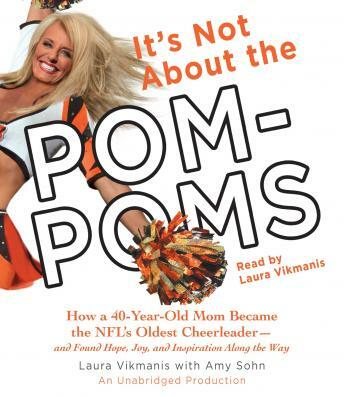 It’s Not About the Pom-Poms follows Laura’s inspiring, funny, and eye-opening journey from demoralized divorcée to high-kicking Cincinnati Ben-Gal. Readers will cheer her on as she rediscovers her passion for dancing, takes hip-hop classes with twelve-year-olds, loses twenty-five pounds, discovers her abs, finds love again, and becomes a new kind of role model to her daughters. Laura also provides an inside look into the fascinating world of NFL cheerleaders—the grueling workouts, bad pay, twice-weekly weigh-ins, but, most important, the lifelong bond between the women, who do it all for the glory. Leading with her heart, Laura Vikmanis faces adversity with her head held high as she learns in mid-life to take a flying leap. Powerful and uplifting, It’s Not About the Pom-Poms shows that, no matter your age, it’s never too late to go, fight, and win!